A dopey B movie that is actually kind of fun, so long as you check your brain (and sense of humor) at the door and just get on board for the decent story, effects, and action. A waste of a film, this movie takes everything that the first Turtles movie, in this reimagining series did, and throws it all away. Gone are the dark tone and attempts at believability. Gone are the memorable action scenes. In place of them is a ridiculous premise of inter dimensions and stupid mumbo jumbo. This movie wants us to just go along and accept everything it gives us, but it doesn’t even try to make us care. In the 1990s, the Teenage Mutant Ninja Turtles were not only a financial mega hit, they were also a cultural phenomenon. They spanned multimedia platforms and different areas of entertainment, from comics to TV shows to toys to movies. The first Turtles movie, with its dark, but playful tone, was actually quite good. And then the series got worse and worse and the public lost interest. So the Turtles went away. But two decades later, producer Michael Bay decided the time was right to bring them back, and the first movie that came out of this reimagining wasn’t half bad. It’s quite unfortunate, then, that the sequel most certainly is. This sequel, Teenage Mutant Ninja Turtles: Out of the Shadows, completely undermines and throws away everything that made the first movie work. And none of this is saying that the first movie was anything great. But it was better than could be expected, and the sequel is absolutely worse. That first movie, like the original nineties film, went for human characters and believability whenever it could. Now obviously human sized turtles and a human sized rat are not believable at all, but the world they were living in that really went for a dark and occasionally gritty tone. Other than the Turtles and Rat, the rest of the characters were all humans. The story was about crime and corruption. Compare that to the sequel which is all about another world with aliens, space ships, and different dimensions. It’s putting itself in a completely different league, and doing the exact opposite of what the first movie did. The first movie, while hardly a great film, actually tried. It was built on style and creativity. For example, the movie didn’t even show us the turtles until a solid ways into the film. It had reporter April O’Neil (Meghan Fox,) showing up on the docks based on tips about a crime ring, and the turtles getting there to fight while staying completely hidden in the shadows. This created mystery. After the docks scene, there was a subway platform scene. And still we did not see the turtles. And that was a good thing. 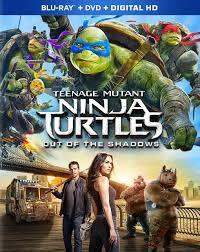 In the sequel, it is all turtles all the time, and very little effort or care as to how they are presented. The second movie starts with the Turtles jumping off a building and then landing on each other, while hanging on a ledge, like gargoyles. The joke is about whether they were supposed to land in “turtle formation,” or “squirrel formation.” From there, we move to April at Grand Central Terminal in NY, and we actually get a decent scene. She has a watch that can hack into other people’s computers, if placed close enough to them, and she uses it to try to get information from Baxter Stockman, a scientist played by Tyler Perry. The scene has Fox steal a mini skirt off a rack, and use multiple disguises. It is probably the best scene in the entire movie. It’s fun, light, and Fox looks extremely hot. She’s got energy and ambition to boot. Too bad that doesn’t carry over to the rest of the film. Baxter Stockman, in this movie, is clearly meant to be a take on the world famous scientist and astronomer Neil De Grasse Tyson. As played by Tyler Perry, the character really does look just like the real life scientist. But then, just in case you missed it, the movie visits and calls out references to the Hayden Planeterium in the Museum of Natural History, the place where Tyson actually does work. This element of using the real location and being a reference to Tyson is kind of cool. And there’s still one more thing to like about the movie. A Knicks game scene where the Turtles watch from inside the jumbo tron on the ceiling, high above the game. This not only gives us a cool location, but then down on the court, we learn the story of how Verne from the last film, (Will Arnett,) took all the credit for saving the city from the Foot Clan, (in the last movie,) and now calls himself the Falcon. He has become a media sensation, and the Turtles resent him for it. There’s a decent Shredder escape scene, from a prison convoy, but at this point every good idea is accompanied by an equally prevalent bad one. The Knicks game rafters scene was accompanied by a stupid spitball moment with the turtles. The Shredder escape scene is accompanied by the idiotic idea of having giant sized nunchucks on the side of the van. But at this point, we are still only about fifteen minutes into the film, and whatever fun the movie was having suddenly stops. Shredder gets sucked into another dimension and meets Krang, an alien brain. The two of them decide to take over the world together. This is where the movie starts to become irredeemable. We are told that everyone has an animal spirit inside of them and that exposure to certain alien tools can bring that animal out. This is what I mean about the movie not trying at all. It leads to Bebop and Rocksteady, two henchmen characters from the original series. 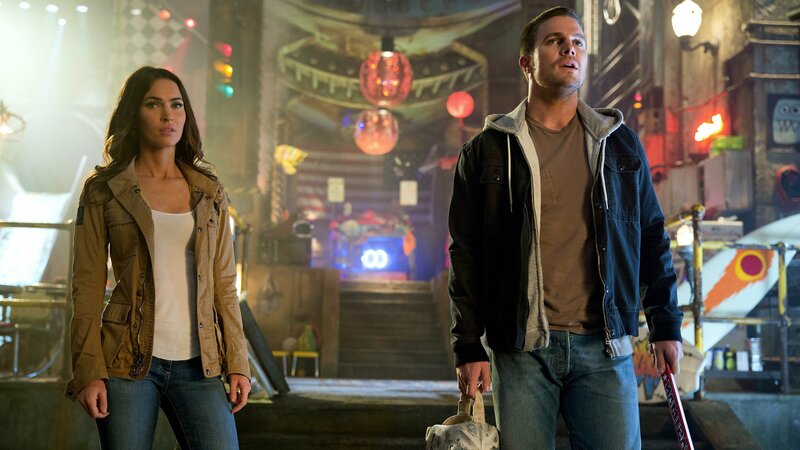 There’s also Casey Jones on hand here, played by Arrow’s Steven Amell. This guy wears a hockey mask and uses a goalie stick to beat on bad guys, but he is no Casey Jones. Instead of a regular guy vigilante, this dude is a policeman who gets put on leave because he’s too stupid and helpless to protect his cargo, Shredder, from escaping the convoy. In the nineties film, actor Elias Koteas got the Jones character just right. This new version is the pretty boy high tech robot like take. There’s nothing interesting about him at all. Pretty much everything about this movie that could have been good is wasted. Splinter does nothing. Shredder might look cooler then in the first film, but here he doesn’t even get to fight. He’s put on the sidelines and is literally frozen for the climax. Krang and Bebop and Rocksteady should have all been cool, but the movie puts no effort into making them work. This one goes full on sci fi in the very worst of ways. That means it tries to use a sci-fi storyline to shrug everything off and make excuses. What a waste.